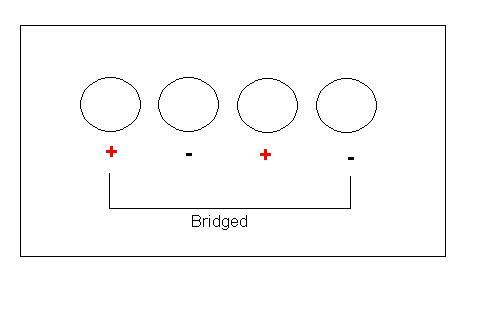 According to crutchfield's wiring diagrams, (2) SVC 4ohm subwoofers can be wired @ a 2ohm load or 8 ohm load. Since my AMP's manual says 180 x 2 @ 2ohms, does that mean that I can comply with the 2ohm parallel wiring? How should I wire both the subs and the amp? yes, you can just wire it to 2 ohm and you will be gettin 180 on each channel. 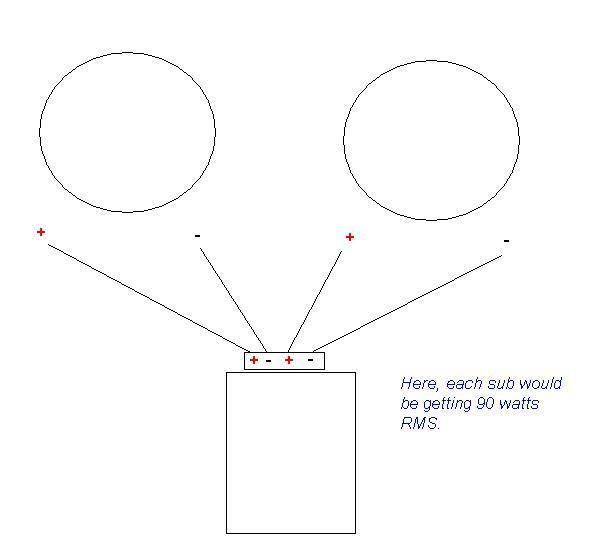 Your problem here, is, you'll only be getting 180 to both subs, so each would only be getting 90 watts. If you wire them parallel, that is. 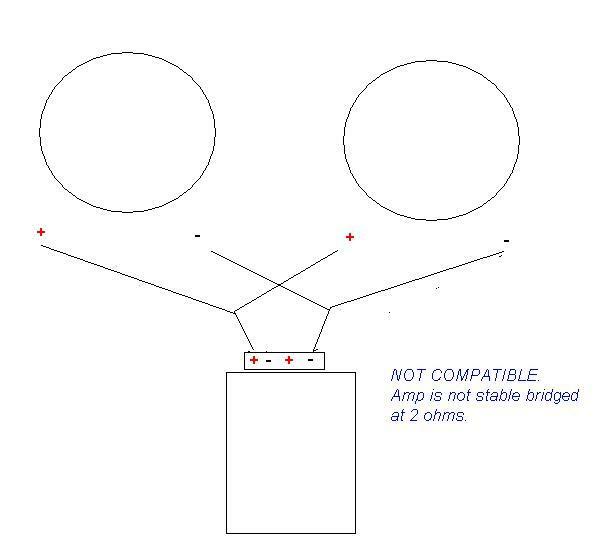 You cannot bridge the amp, for the full 360 RMS, into a two ohm load.. Your amp and sub combo are not a very good match at all. Dual 4 ohms are hard to work with, but you can find some amps that are actually made to put out full power at two ohms (mono amps). Do NOT hook up your amp like that, you could damage it. do u have a diagram seth that will show this guy how to hook up to each channel? 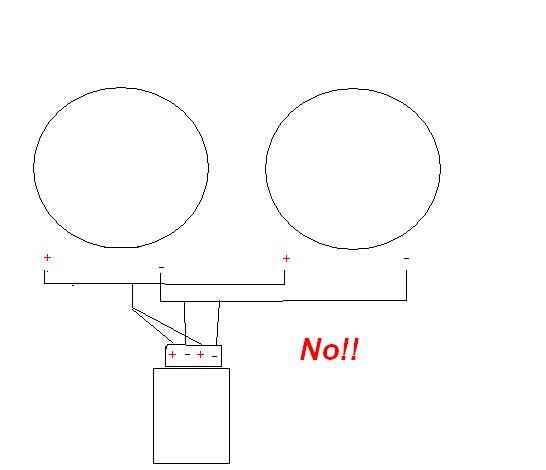 If you look where you plug your speaker wire in on your amplifier, it should look something like this. The last one is the one I would recomend, since if you're running your subs in stereo mode, they're each only going to be getting half of the signal (left and right channel going to each sub.) 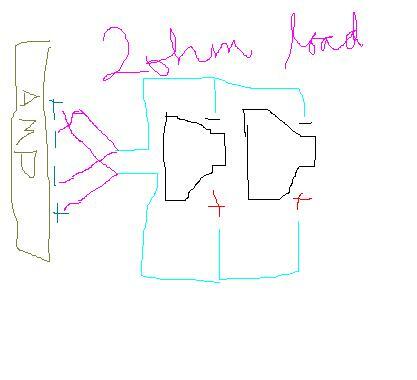 Whereas in the final picture, you're bridging your amp into a mono channel, that combines both left and right into one signal, and is still splitting the power evenly. Also, at 8 ohms, your amplifier will have more control than it would over a 2 ohm load, as well as run cooler. (in most cases). With your current setup, there is no way to get the full 360 watts RMS from the amplifier safely. Do NOT do that! This could damage your amplifier, or subs, or both. 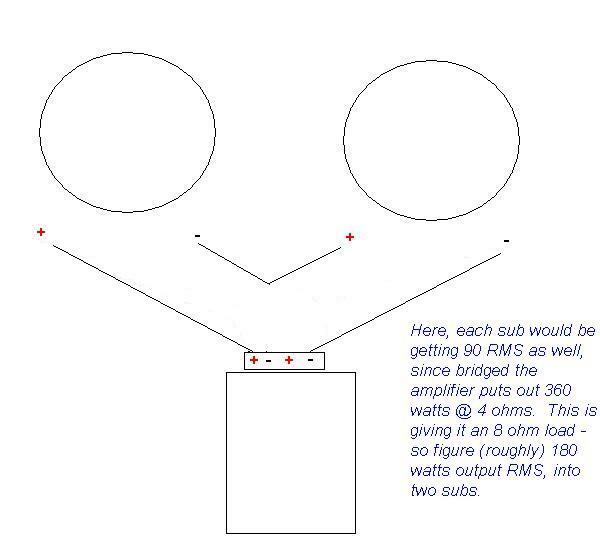 how do u know how many watts the amp would put out that much power at 8 ohm when it doesnt say? wut load will be on ach channel to give eahc sub approx 180 watts?? And he cant give each sub 180 watts with his current setup. His amplifier and sub combo dont mix so well. If he had a pair of 2 ohm subwoofers, he could wire them together to make a 4 ohm load, and then bridge the amp for 360 watts @ 4 ohms, and each one would get the 180 watts then. But with dual 4 ohms, and a 2 channel amp, it's not gonna happen. hey guys, thanks for all the help I decided to cancel out on those subs and go with 1 JL 10W3V2 DVC @ 4ohms so I can keep the PPI amp You guys rule! u needed a DVC 2 ohm sub though so u could wire to 4 ohms. Prashant Patel, dont do that!! Getting a DVC 4 ohm sub, is like having a pair of 4 ohm subs! Get a dual voice coil 2 OHM version, so you can wire it to 4 ohms.